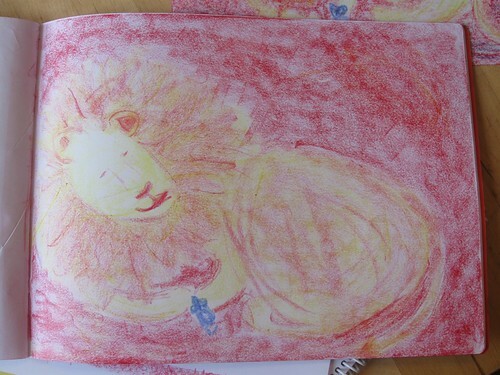 Schooling from the heart: Week of lions... and Greece! Last week, to meet Moonshine's request of more "boy saints," I presented her with a story about St. Jerome and the lion. I wrote her a flute song based on this story, and I was so glad that it was such a hit because I had planned a whole week of lions. I also mentioned last week that Moonshine is trying out some new behavioral territory. Could it be the nine-year-change approaching already? I'm hesitant to label it as such, but I do know that it's making us all crazy, herself included. She's being antagonistic to everyone and she's not sleeping well. It's a dangerous combination... and well, she rather is like a lion. I carried over the heart theme from last week, and challenged Moonshine with a poem I wrote just for her. She copied it into her copy book, memorized it, and recited it--- all with great joy! And because she's insisting to write things phonetically and without help, I pulled some words from the poem and challenged her to her very first spelling quiz. She was so excited!! She remembered every single word, and she can't wait for her next quiz. 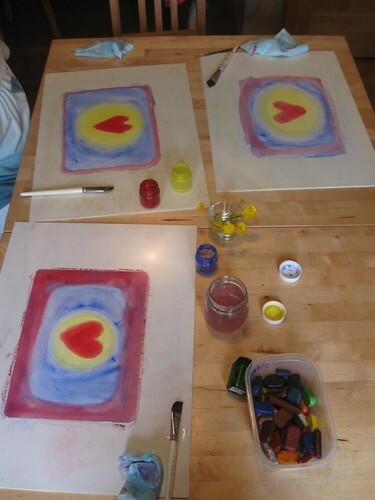 To extend the heart theme, I invited the kids to watercolor-paint some hearts. 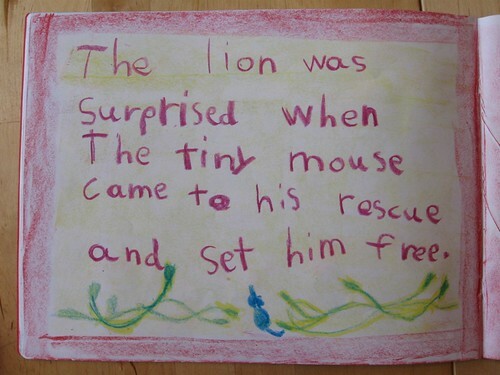 Then to extend our lion theme, I went ahead and pulled from my second grade materials and told the story of the Lion and the Mouse. It was a good reminder of kindness as well. 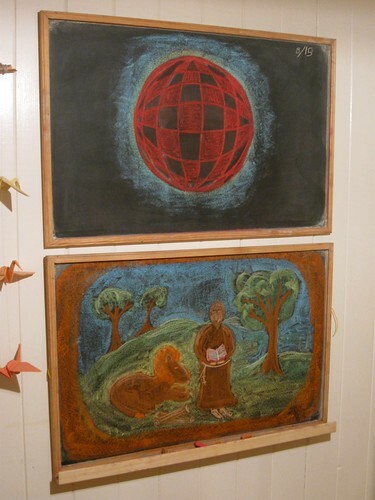 --Those of you who have Teaching With the Fables by Sieglinde de Francesca will recognize my attempt to recreate the picture from the cover of her lovely, lovely book. Sunburst and I worked on Greece, Greece, and more Greece. And math, of course. I also tossed another wondrous geometrical form her way, shown at the top of this post. She is lapping it up. 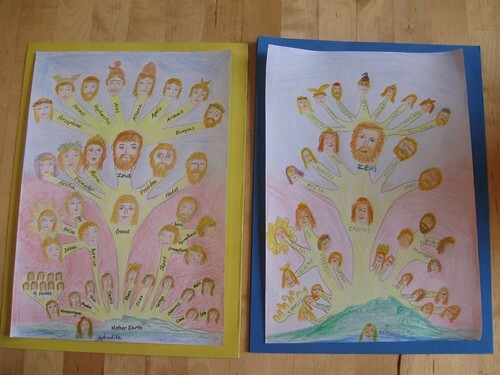 We also worked together to copy out the amazing family tree from the front of D'Aulaire's Book of Greek Myths. It was a challenge, for sure, but we worked at it little by little over the last two weeks, and it's already helping us to keep all the Greek mythological gods and goddesses sorted. Greece is definitely a lot of fun! i never did ask you, but it seems you like the de Francesca fable book? it gave me so many good ideas, i can't wait to try them out! Aw, thanks, Cari. We had such a great time, too! And yes-- that fable book is super! Thanks for recommending it to me. I actually didn't enjoy the fables when I did them with Sunburst. I'm so glad this book came out in time for me to actually enjoy them with Moonshine. Oh Sara, I am so happy to see these back to lesson posts! Your work is beautiful and inspiring as always. 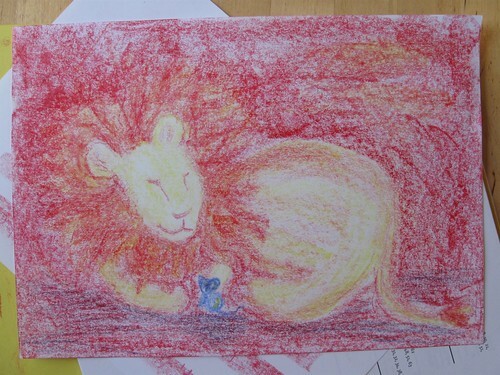 Teaching with the Fables is one of my favorite resources, we drew the lion too. I have been doing lots of lesson planning, lists and notes... I think I should take the weekend to focus a bit more on the artistic... We are beginning next week! We will be starting grade 5 using a mix of styles. I have another daughter starting 3rd, who will be doing a mix of grades. We look forward to browsing your posts. I started reading your blog earlier in the year, and want to thank you for all the work you put into keeping it. 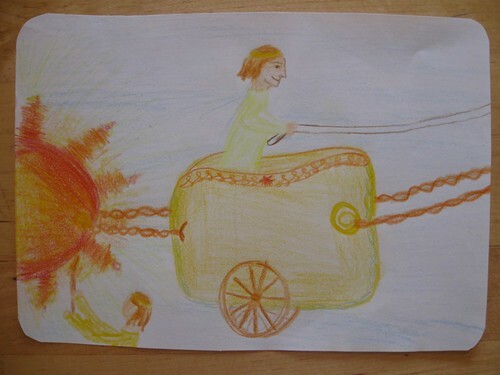 We are just starting homeschooling (ds will be seven in a few weeks) grade one, and I feel so lucky to have the inspiration of blogs like yours. Your children are very blessed. I discovered your great blog today. Reading a bit, I discovered that you live in Switzerland too. Nice to know, that there are fellow homeschooler in the blog world. Don't hesitate to tell me if I can help you with something concerning Switzerland or German. Eva, thanks for the sweet words. You are amazing to be doing what you do with five children AND blogging every day. I don't know how you do it!! Momasun, thanks. And it's so nice to hear someone else is doing mixed grades work, too. 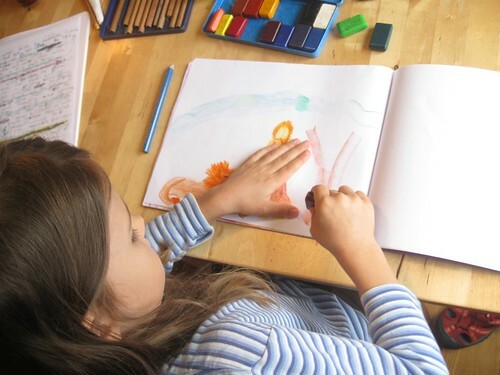 I love that about homeschooling! Cathy, thank you so much for the kind words. Kitty Bill was very interested in knitting about a year ago, just before he turned four. But now, like your son and others we know, he just wants to build things. I find it amazing-- and there are so many materials out there for them to explore with! Sara, I left a comment on your blog entry from August 21, 2009 with some questions about some of the materials you used. Did you see it? Eva, thanks for reminding me. I didn't see your question until 2 am this morning as I was on my way to bed. I thought it deserved being answered by someone more awake than I was at the time. ;) I've just answered it. I used some additional resources for Egypt, too-- I will try to dig those up and post them for you as well. 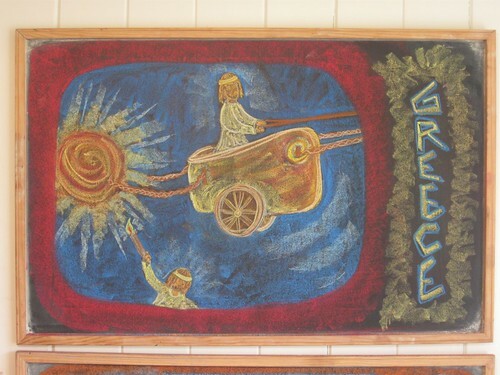 I love all the chalk drawings.....your posts are always so inspirational! Sara, no, you're right there aren't many homeschoolers in Switzerland. But there is the annual meeting, this Saturday. Did you know? CCETSI, thanks for the reminder! We've been to Teufental once before, but not to the annual meeting. Do they conduct this one primarily in Swiss German as well? Jen, thank you. You always have the nicest things to say. I'm afraid my Grade 2 post isn't updated very well from this past year. I just added a few links in and marked the resources that I really loved... hopefully I will be able to get some other things up too, as we are still juggling the boundary between Grade 2 and 3 and I'm pulling lessons from both. Do they conduct this one primarily in Swiss German as well? It's a mixture, some are speaking German but last year there were also quite a few speaking English or other languages.